The Captain is different. Even people who root against the Yankees, find they can not root against Derek Jeter. He has done it correctly from the beginning. He knows the history of the game. He knows the history of the Yankees. Even though he grew up in Michigan, he was a Yankee fan through and through. He has spent his entire career with the Yankees even with other teams courting him during free-agency and even after the Yankees turned their last negotiation into a sideshow, proving the kids are their father's sons. All season they - those out there who write or have a voice via a TV or radio show or even a phone to call one of the aforementioned - have said he was done...toast. .250 batting average...no power (when did Jeter ever really have power?). Friday night the game was rained out. 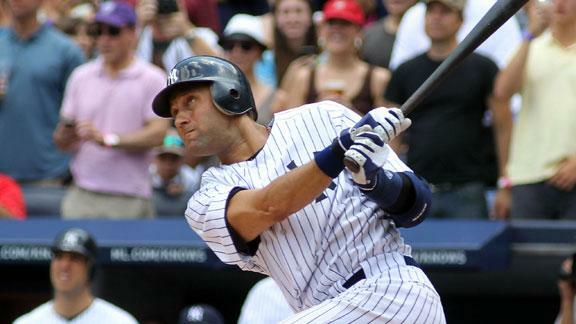 It seemed fitting that Derek Jeter would hit the milestone on a bright sunny day in the Bronx. Saturday in his first at bat he hit a rope to left field for hit 2,999. It was an 8 pitch at bat during which Jeter battled on every pitch. He later said david Price, the Rays pitcher, could have thrown the ball in the dugout and Derek would have sung he was that anxious. Then in the third inning with 48,000+ standing in the stands, Jeter and Price battled again and again on the 8th pitch the ball took off into the sky and did not fall until it landed some 420 feet away in the hands of Christian Lopez in the left field stands (more on him in a moment). Derek decided the day was going pretty darn good and ended up with 5 hits in 5 at bats. He stole a base and his last hit drove in the game winning run. One black mark on the day was Jeter being thrown out attempting his second steal of the day. So...in the end...think about it, because on this day the NUMBER 2 RULED! Now Christian Lopez...this young man had the ball in his hands. The Yankee officials moved him into the bowels of the stadium. THey asked, what do you want for the ball? His response, "I don't know. I would like to give the ball to Derek." Yankee brass said sure. Then Lopez spoke up and oyu know the officials began to get nervous..."Can I get a jersey, a couple of signed balls and bats too?" Taking a deep breath and realizing Lopez was not going to write a 6-figure number on a sheet of paper or walk out with the ball and sell it to the highest bidder, the Yankee brass then did the right thing. They ponied up the swag Lopez asked for and then handed him tickets for every game for the rest of 2011, plus he will get seats at any post season - including World Series - games the Yankees play in. 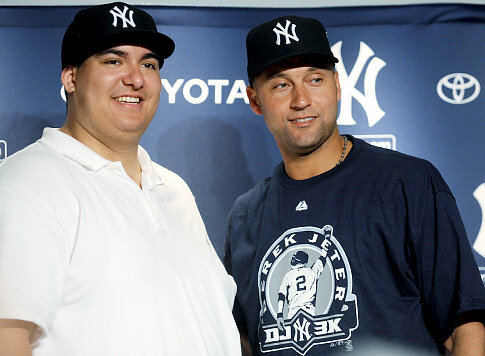 And he got to meet Derek Jeter and hand the ball to the only man who should hold it. Please check your spam as I am now sending mail via newsletter@musiconthecouch.com - THANKS! Charlotte Sabina has been playing piano for three years and guitar for two. After singing an original song at a school event, her teachers all encouraged Charlotte to continue her pursuit of music. Last fall she was asked to be a part of an interactive piece by Tino Sehgal at the Guggenheim Museum in Manhattan. Then, for her birthday, her parents surprised her with time in a recording studio with producer/guitarist Jeffrey Lee Campbell (Jon Bon Jovi, Sting, Aretha Franklin, Michael Bublé). And she now has four pop songs under her belt, (“Green,” “Moonlight,” the girl-rock anthem “Not the Girl,” and her second, tear-jerking dedication to her brother, “Partner in Crime” ). Sabina is deserving of the sort of buzz that launched artists such as Taylor Swift, Justin Bieber and Miranda Lambert. All the money Charlotte is making by the release of her music is being given to Doctors Without Borders. Pretty grown-up for a ten year old! Lisa Shepard was born in Houston, TX and her parents immediately began surrounding her with music, taking her to concerts as early as 7 years old. Her mom was friends with Elvis Presley, George Jones, and rockabilly pioneer Tommy Sands, whose fan club she ran. Lisa then took those roots and discovered the Beatles, the Rolling Stones, Janis Joplin, and the Eagles, and at age nine she started guitar lessons. By age 16, however, her attention had turned toward a different type of stage, and she decided to pursue a theatrical career. In 1988 Lisa moved to L.A. and began a life as a playwright and theater director. Within 6 years her life had taken a number of turns and twists and Lisa moved on in her life. It was 20 years later, in 2008 when music and Lisa Shepard began their romance once again and Lisa shared One-Track Mind, a collection of 10 originals that caught the attention of blues and alt. country radio stations. Now Lisa is out with her sophomore effort, Neon Lights and she will be joining me to discuss the road she has followed and where she is heading. Remember, unless you take the two minutes to register, you will not have full chat room features, but you will still hear the show. You can download to your iTunes and even subscribe to the show for weekly automatic downloads, from my Tunes page. Yes, it was a day to be a baseball fan and not a team fan. A truly remarkable performance by both Jeter and the guy who caught the ball. I only went four for five when I hit my 3000th. I missed the big day, but we read about it later. As a Dodgers fan, I should always despise the Yankees. But you know I haven't been able to do that since a certain day in September 10 years ago. And I have always appreciated the way DJ approaches the game. He's one of those rare favorites of mine, and it just doesn't matter who he plays for. So well done DJ, and well done Mr Lopez. What's great about Jeter is he's everything Alex Rodriquez is not. And I hate everything about A-Rod. I get tired of the over the top media coverage of Jeter, but I've always like him. Always loved Jeter. Thanks for the interesting background information, Vinny. I learn something everyday on The Couch. to be really honest with you I'm surprised that it was about the money for me too!